Today, the BBC's South East Asia correspondent Jonathan Head returns to Mae Sai in northern Thailand, where members of the Wild Boars football team were rescued from a cave in July. For three weeks in June and July, the fate of 12 young footballers and their coach, and their sensational rescue, made Tham Luang caves the most reported place on Earth. Five months later, it is now one of the most visited spots in northern Thailand. Back in July, a massive pumping operation to lower the water levels inside the caves was sucking out millions of litres an hour, water which cascaded down the hill, flooding the surrounding fruit and vegetable fields. One of them was used by Archawin Mopoaku, an ethnic Akha, one of several hill-tribe minorities living in the area, to grow pineapples. But he did not complain. Instead, he abandoned farming for a while, and volunteered, cutting bamboo to help the army carry supplies up to the cave entrance. Today Archawin's pineapple field lies untilled. And next to it, on the unpaved road climbing up to the caves, he sells oranges from his orchard to tourists, a venture he says is making him a lot more money than his pineapples ever did. Image caption Archawin Mopoaku: "Hill-tribe people like me are doing well"
"Before the rescue it was very quiet around here", he said. "Only once in a while a few foreigners would come up to explore the caves. But after the rescue there are far more people coming, and hill-tribe people like me are doing well." So are the flower sellers calling out to customers at the entrance to the road, the snack vendors grilling pork, the souvenir stalls and, in particular, the lottery ticket sellers. Who are the rescued boys? A park ranger sits on a plastic chair under a palm-thatch canopy, keeping a hand-written list of the visitor numbers. That used to be easy. Typically they would get 10 or 20 a day. Now it is more than 6,000. Most of them are Thais, coming from all corners of the country to see where the rescue took place. "Right now, no other tourist attraction in this region can compete with Tham Luang," said Damron Puttan, a magazine publisher and TV personality who was visiting. He was travelling in Europe when the story broke in June, he said, and he was struck by how much attention it was getting over there. "I never knew about these caves before the rescue", said Vanisa Achakulvisut. "But after all the news about the Wild Boars football team, I had to come and see it for myself." It isn't just curiosity drawing in the crowds. The mountain range above the caves is named after Nang Non, a mythical princess who killed herself over an illicit love affair, and whose sleeping form the mountain is said to resemble. Caves are traditionally viewed as places of great mystical power in Thailand. There has long been a shrine to Nang Non, next to the cave entrance, where people could make offerings to her spirit. But the seemingly miraculous rescue has enhanced her allure as a bestower of good fortune. 2018's big stories: What happened next? Every visitor I saw came clutching flowers, and said a short prayer at the shrine. It is now a lucky place to buy lottery tickets, and the most popular numbers end in 13, the number of boys and their coach who were trapped in the cave. Now they have another shrine: a three-metre-high bronze statue of Saman Gunan, the Thai diver who died during the rescue. I watched them position it in front of a new, and still empty museum, built in the once mud-filled car park from where we had reported the search and rescue effort earlier this year. The boys, and coach Ekkapol Chantawong, who had helped them endure their 17 days underground by teaching them to meditate, were there as well, only their second visit to the cave since they were brought out. Some of their rescuers had come too. 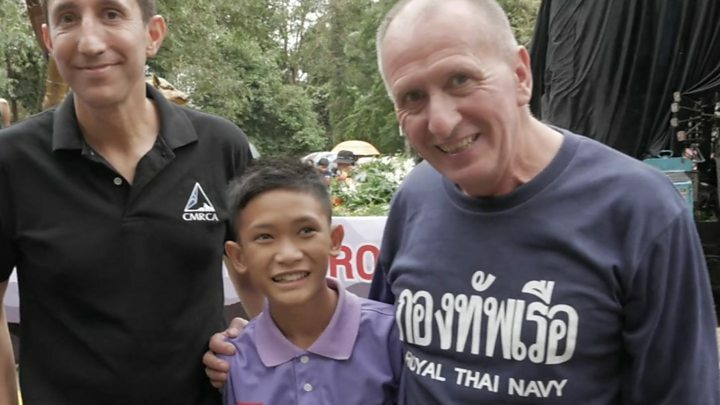 Mikko Paasi, a Finnish diver who helped lay supplies for the final recue, American Josh Morris, who runs a climbing school in Chiang Mai and was a crucial intermediary between the foreign divers and senior Thai officials, and Vern Unsworth, the British caver who has spent years exploring Tham Luang, and one of the first on the scene after the boys went missing. It was a moving reunion; 12 boys, looking fit and cheerful, whose lives, against such tremendous odds, were saved, now hugging their saviours. The Thai government is still very protective of them. They have child welfare officers with them in all their public appearances, and anyone wishing to interview them must go through weeks of rigorous screening by two committees. Their families too have been instructed not to speak without official permission. "For me it's still quite emotional", Vern Unsworth told me, as we looked at the new green fence now blocking visitors from entering the cave. "Some people think that to get 13 out of 13 out was a bit of a miracle. "I think the world outside was expecting a bad result. But we never gave up. What the divers did was just an incredible feat of endurance." No-one should blame the boys or their coach for going in, he said. They were just very unlucky. "It could have been me." Vern had planned to go into the caves the day after. The water inside rose very suddenly, after unusually heavy rainfall that day, trapping the boys and coach Ek, and driving them deeper into the caves. Has the experience changed their lives? "They are an amazing group", Vern said. "They have stayed level-headed, they are being well looked after. I wouldn't call it a normal life - they have been on tour around the world. But they are all back at school." Their head coach Nopparat Kanthawong said they were all training hard after school, just as they were before the rescue. They have regained the weight they lost, he said, although they are still rebuilding their muscle strength. There is plenty of interest from groups keen to help them; we watched a coaching team from Manchester City train them on their hillside football pitch. At least three projects to make feature films based on the rescue are under way. The first, named The Cave, has just finished filming. Vern and the other divers hope the cave site and the museum can be used for public education about the geology, flora and fauna in the surrounding area. For the top official in Mae Sai, district chief Somsak Kanakham, all the additional income and business opportunities from the mini tourist boom at the caves are very welcome, in a poor, largely rural part of Thailand. He does worry, though, about how to keep the momentum going. The area needs better infrastructure to cope with the tide of visitors, and the extra traffic, he said. Longer term, he hopes to get outside advice on how to develop other potential tourist attractions in this pleasant green and mountainous area. At some point all the excitement generated by this extraordinary rescue will start to fade, and with it, perhaps the visitor numbers too.